Angel Anastacio is the 26-year-old crafter behind 400 Lux. Angel Anastacio has a cute Instagram feed. It’s filled with crocheted unicorns, owls, mermaids, dream catchers, and pop culture icons like Groot of Guardians of the Galaxy and Mike Wazowski of Monsters, Inc. Almost everything you see on her feed, she created from scratch with her own two hands. 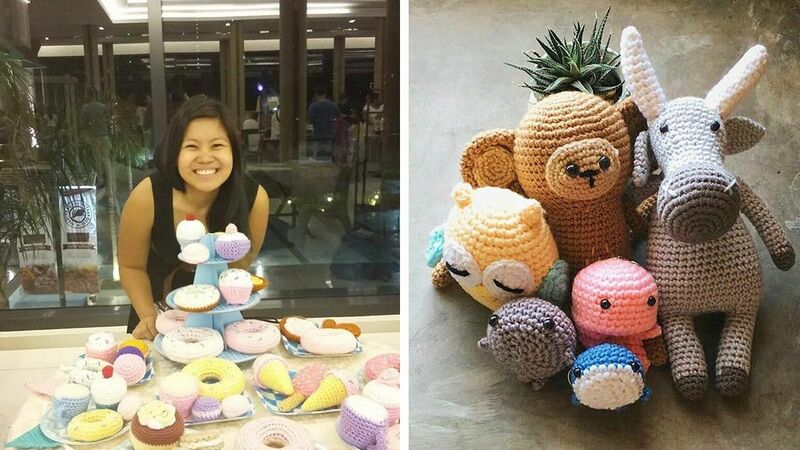 We sat down with the 26-year-old crafter and asked her how she turned this fun hobby into a moneymaking venture. Tell us how 400 Lux went from being a hobby to a business. I intended for 400 Lux to be a business selling accessories. I started in March 2014. I joined a lot of craft fairs and pop-up shops. Within a couple of months though, I picked up crocheting as a hobby. The turning point was when I joined the BGC Art Mart, where the theme was food. I made amigurumi food, which was received well by customers. The rest is history. Where did you get the name 400 Lux? It’s actually the title of my favorite Lorde song. It means the measure of illuminance during sunlight and sunset. I meant to change it to something blatantly crochet-related, but as the brand name already has name recall, I chose to stick with it. A few years ago, you created jewelry with beads and other materials. What made you decide to focus on crocheted crafts? I started the jewelry business because I thought that’s what the market wanted. Now I make what genuinely interests me, and a form of art that I am passionate about—thread crafts. What are your bestsellers and how much are they? How lucrative is the arts and crafts business in the Philippines these days? There’s been a boom in fairs, which has helped individual artisans showcase their craft. Also, many arts and crafts stores have popped up, which makes it easier for crafters to showcase their products and have physical stores. How much do you make monthly from crocheting? It really depends. On lean months, I make P8,000, and during peak season, I can make P19,000 gross. Did you take classes to hone your craft or is it a talent you developed on your own? I developed it on my own. I watched YouTube videos to learn. Are you a one-woman team or do you have other crafters in your company? I aim to be a social enterprise and to help others while growing my business. Right now, I have five mothers from Gawad Kalinga Blue Eagle Village producing most of the products. Are you a full-time crafter or do you have another main job? How do you balance both? I am a part-time Values Formation Coach in a progressive school. At the same time, I am studying MA Psychology (clinical track) in UP Diliman. Having employees has helped a lot, since I don’t need to make the products on my own. It really differs depending on the orders. School is my main priority right now, and I go there on weeknights. I go to my day job two and a half days a week. I occasionally go to Gawad Kalinga Blue Eagle Village when there are orders. 400 Lux is a nice addition to the things that I’m already doing. It’s my passion project. Describe the crafting community in the Philippines. It is very supportive. We collaborate, rather than compete, and share ideas. We connect with each other mainly during craft fairs. Where do you get ideas for new creations? The customers usually give us the new ideas. For example, someone ordered shark socks, something that I never would have thought of myself! What are your tips for startup crafters who want to turn their hobby into a business? Stick to what you are really passionate about. Also, do research on the pricing. Be competitive, but not to the point that you are selling too cheap. People usually are willing to pay a considerable amount of money for products that are of high quality. 400 Lux is available at Craft MNL, Makati; CO/OP, San Juan; and Mrs. Graham's Cafe, QC. Also visit them on Instagram, Facebook, and Etsy.